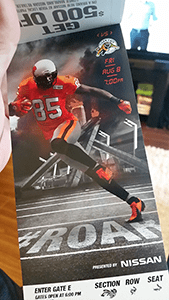 On Saturday June 28th, BC Lions fans enjoyed another great Tailgate party in Tailgate Empire, otherwise known as Easy Park Lot 16 at Quebec and Terminal. Rain didn’t dampen our spirit and a great time was had by all. Following last weekend’s game, I was contacted by Easy Park who has asked me to relay a reminder to all tailgaters that each stall you use must be paid for. On Saturday because of the weather, several tailgaters brought pop up canopies and set them up in the stall next to their vehicle, but only paid for the spot their vehicle was in. Easy Park recently changed the metering system in our lot to a license plate registration system. Only one license plate can be registered for a given time period. I have been asked to tell tailgaters that if you need a second stall, you must purchase a second ticket using the number that is painted in the stall, and you must be prepared to show the attendant your ticket for that second stall if requested. You must purchase a ticket for the amount of time you wish to use the second stall. Easy Park has been incredibly cooperative with us, allowing us to do what we love before BC Lions games, and to ensure we are allowed to continue to do so in the future, I ask that all tailgaters follow this rule, without exception. They will be speaking with their enforcement officers to let them know this will be the case. I want to thank all of you who have joined us and continue to join us each game for following our few simple rules. The lot continues to be spotless after the game, and that is a testament to you the fans who value what we have built here. I want to send thanks to Easy Park for working with us and for their patience with this matter. Let’s not let them down. I would also ask that if you’re parking downtown, please try to give this company your business, it’s the least we could do after all they have done and what they continue to do for us. To refresh yourself on the other rules we follow, please visit our Tailgating Page.